I visited two cemeteries to see plots of great grandparents that I never knew, surnames: Vinti and Bruno. 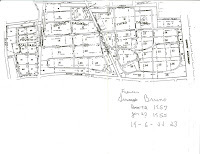 The two cemeteries are: St John Cemetery at 90-01 Metropolitan Avenue, Middle Village, New York (location) and Calvary Cemetery, 49-02 Laurel Hill Blvd, Woodside, New York (location). Both were accessible (with a few blocks of walking by subway/train from midtown). I did take a taxi from St. John to Calvary (too far to walk). For any cemetery visit, stop at the main office first and save yourself time if you don’t know what you are looking for. I didn’t know where to even look so a stop at the office was necessary. I found out that a typical plot (marked with a headstone) that my great grandparents have are stacked 3 high (as in coffins). In both sets of relatives, there remains space since only a husband and wife are buried there. Who inherits the plot? All living descendants. At St John, the very helpful Polly explained the whole thing to me. Makes sense. I also filed for a maintenance request because of rampant hosta plant from a neighboring plot totally obscured my relatives. The trick at Calvary is to figure out what part of Calvary you need to go to. There is Calvary 1, 2, 3, and 4. Parts 2-4 are close, but 1 (the oldest part) is a bit far from the other two parts. Part 1 is for old, old burials. Most likely you’ll be looking in Parts 2 - 4. The main office for Calvary is in Part 2 anyway. Apparently there are 3+ million people buried there. One question that entered my mind when looking at the aerial photo of Queens is why are there so many cemeteries? Apparently, the area is called the Cemetery Belt and there is a good reason for it. It is because of the Rural Cemetery Act passed in 1847 in New York which commercialized the burial process. Results: success on both accounts. Both plots were located and I spent some quality time with my great grandparents on a very hot New York summer afternoon. 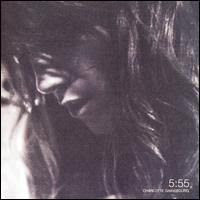 The album 5:55 by Charlotte Gainsbourg is one of those albums that I keep wanting to listen to in an obsessive way that’s not always good. It happens every once in a while. It’s odd because when I first listened to this album I thought, oh it’s interesting and then put aside for a few weeks. Then I listened to it a second time and I was hooked. The combination of the music (by Air) and lyrics (by Jarvis Cocker and Neil Hannon) are perfect for Gainsbourg vocal style – a whisper. The standout tracks for me are 5:55, The Songs We Sing, Little Monsters, Jamais, Night-Time Intermission and Somewhere Between Waking and Sleeping (on the bonus CD). The whole album though, holds together as a unit, it's just that I find the mentioned tracks are the ones I'm most often humming. They were the soundtrack for my New York City visit. Charlotte Gainsbourg is the daughter of the famous French musical provocateur Serge Gainsbourg. Central Park is impressive. We had outdated impressions of a rundown, dangerous park that people avoided. That was not the case at all. It was well-maintained, safe, and was filled with all types of people enjoying the park in various ways. We were impressed by the size of it (840+ acres), the number of activities available, the various walking, running, and biking paths, and the overall appearance. The land for the park was purchased in 1856 and the park was officially opened in 1876. Over 125 years later, the park looks great. Credit goes to the Central Park Conservancy who over the last 25 years halted the slide of the park in the 1970s and completely turned its fortunes around. Especially interesting to us were the large rock outcroppings of Manhattan schist. The schist bedrock layer (also called Cambrian Manhattan Formation) provides a great base to build upon. Central Park is apparently a popular site for geology field trips because the Manhattan schist crops out in so many places making studying it easy. I was curious to see how the Metro-North train service between Grand Central Terminal, New York City and New Haven, Connecticut would work. Overall, I was pleased with the experience. Pros: Economical way to travel, you can pay in a number of ways including on the train, very convenient to just leave or arrive in middle of New York City. Cons: the trains seemed a little dated and in need of a facelift inside and the travel time for just 73 miles was a bit over two hours which seems a little long. I bought tickets at Grand Central a few minutes before the train left and was fine. On this Monday there were a lot of commuters going to work in Connecticut. However, there wasn’t a crunch on seating. Most got off in Stamford. The train arrived in New Haven a few minutes late but acceptable. 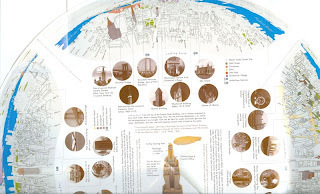 More interesting would be if you wanted a connection to different city like Waterbury. The time for transfer is listed as 7 minutes and I think that’s cutting it a bit close. We stayed at the Milford Plaza Hotel for five nights . It was okay, average. It’s the first time I’ve stayed in New York, so I don’t have a lot to compare it to. Travelmarx with a k has stayed in NYC before and said it was appropriately priced for what we got. Good points: location, friendly staff, free internet in our room. Bad points: small room for us, cheapo breakfast, elevators took forever to come (we descended 17 flights of stairs, but climbing them after a long day was a bit much). The hotel is supposedly under renovation. I’m hoping by the lacking state of our room that ours hadn't yet been renovated. When we checked in they said that we were in a “club” room. Don’t know about you, but that conjured up an image of a nice room. Not an oversized closet with one (broken) chair and a bed and the need to shut the bathroom door to be able to leave the room or get in the closet. In a word: small. However, I guess this is par for hotels in NYC for the range we paid (~ $300/night, gasp, for a double). 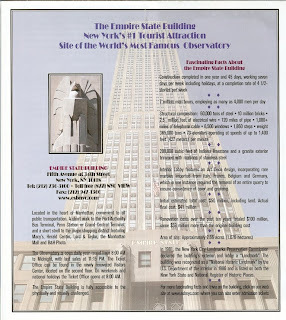 The hotel is located just west of Times Square and is on a major subway line or a few minutes away from others. A friend gave us compilations of two Italian singer-songwriters to listen to: Vinicio Capossela and Gianmaria Testa. Both are good and are definitely worth checking out. Capossela’s music makes me think of (and I’ll borrow from his web site’s biography) a “circus artist” – in a good way – with songs populated with “demons and ghosts.” There are hints of Luis Prima definitely. Travelmarx favorites: “Che coss’è l’amor?”(What is love) and “Si è spento il sole” (If the sun were turned off?). Testa’s music is (at least to my American ears) a little more serene, intimate, introspective. However, it does share common elements with Capossela: bits of bossa nova, jazz, and is very lyric-driven. The last element is what always stands out for me for both artists and Italian artists in general, that is, how important words are to the song. Even if I don’t always understand the meaning of the words, the power of the voice, not electronically mangled as is fashion in modern songs, grabs you as, well, human. Travelmarx favorites: “Per Accompagnarti” (To go with you) and “Biancaluna” (White moon?). Some samples of Testa on YouTube. Testa’s instrumentation reminds me a bit of the group The Penguin Cafe Orchestra. The idea of looking through the Puget Sound Business Journal’s 2008 Book of Lists (link) was to help me target places, gulp…, to work. 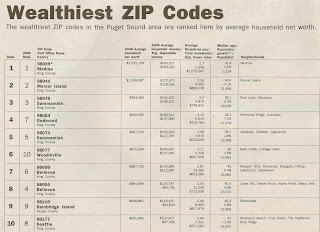 Instead I got sidetracked on the list of Wealthiest ZIP Codes in the Puget Sound Area ranked by average household net worth. I guess I was expecting Seattle ZIP codes to be featured more prominently in the top 10, but that wasn’t the case. The top ZIP code is 98039, Medina (which always makes me think of Tone Loc’s Funky Col Medina – I don’t think this video was filmed Medina but I could be wrong). The only Seattle ZIP code in the top 10 comes in at number 10 and that is 98177 which is composed of the areas called Richmond Beach, Innis Arden, The Highlands, and Blue Ridge. To our friends in Blue Ridge: when is dinner? The facts: the average 2006 household net worth in 98039 (with Bill Gates subtracted out of the mix!) was $1,232,108 and the average for 98177 was $831,959. We headed to Tacoma to have dinner with some friends and decided to first visit the Washington State History Museum. 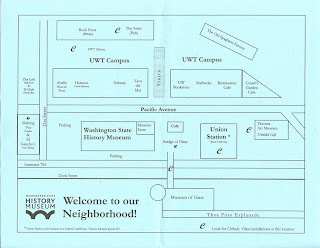 It is located near the Museum of Glass and the Tacoma Art Museum with plenty of ways to get there (bike, bus, street car, car), parking, and places to eat in the neighborhood. 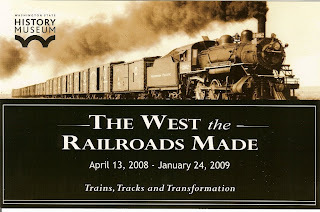 We spent almost all of our time at a temporary exhibit called The West the Railroads Made open from April 12, 2008 to January 24, 2009. What we didn’t really appreciate was the rapid series of events: the Oregon Treaty of 1846 gave us the modern day northwest and the Mexican Cession in 1848 gave us the modern day southwest. As noted above, the government surveys commenced a few years later. Another point of reference is that the Sutter’s Mill gold discovery was also in 1848. The Pacific Railway Act of 1862 was based on work by government surveying teams that produced a respected, comprehensive series of surveys called the Pacific Railroad Surveys (1853-1855) trying to figure out the best route to the Pacific ocean. These surveys are available in digital form. Some of the examples in the exhibit showed interesting drawings of landscapes and plants like the Pinus Ponderosa shown below. At the back of the exhibit at the museum (and we think a permanent exhibit) is a recreation of about 91 miles of railroad track in Washington state circa 1950 – 1959. The large setup (see photo) recreates the route from the shores of Commencement Bay in Tacoma to the Cascade Mountains in Central Washington. 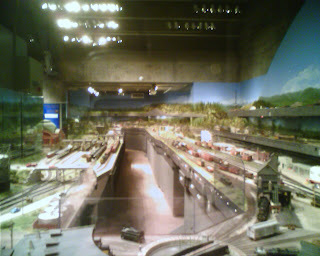 The model was assembled by the Puget Sound Model Railroad Engineers (www.psmre.org). Some music that reminds of our sabbatical (indulge us, will you? ): Duffy’s Rockferry and Katie Melua’s Piece by Piece. The former was played on every popular Italian radio station, especially the songs Rockferry (video), Warwick Avenue (video), and Mercy (video). 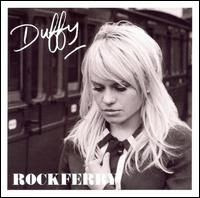 Duffy’s music is a style called (British) blue-eyed soul. Think Dusty Springfield (a legend) with less mascara. Try to not toe-tap to Duffy’s Mercy. The second recommendation, Katie Melua, is something we heard while staying at Garni Delta and it stuck in my mind. Some standouts: the infectious (and a wee-bit sweet) Nine Million Bicycles (video) and Thank You Stars (video). My favorite though is I Cried For You. Melua’s style is world beat / adult contemporary. She is originally from Georgia (the country). Yes, both of these artists are not Italian! The next music post will be about Italian music, we promise.